I have written to you twice previously (on January 24, 2017 and September 18, 2017) to express my concerns regarding your pending investigation of the FBI’s handling of the Clinton e-mail investigation. I continue to hope that your report will shed much-needed light on what transpired. Although I succeeded in obtaining a redacted version of the Clinton search warrant in December 2016, my FOIA requests for an unredacted copy of the warrant application and other materials related to the decision to seek that warrant have been unsuccessful so far. As a result, I will soon be filing suit against the FBI to obtain some of these materials. If your report can also manage to release the underlying documents, I would very much appreciate that. In the past weeks, the release of the Sztrok-Page text messages and Lanny Davis’ new book, have added more details to several issues that I trust are critical to your report. As someone who has been carefully following this matter, I want to share with you some of my thoughts in the hopes that your report will be able to answer some of the outstanding questions that remain. Mr. Davis’ book includes a good deal of material on the beginnings of the Clinton e-mail investigation, but cannot answer the fundamental question of why the FBI converted a non-criminal referral over the classification of documents into a criminal investigation. As I have previously written, the principal statute at issue (e.g. 18 U.S.C. §793(e) and (f)) does not make the sending and receiving of e-mails from a private server to authorized personnel a crime. While the public, various politicians and also Director Comey in his July 5, 2016 statement, refer to “mishandling” classified information, the vague term “mishandle” does not appear in the statute. The law concerns “removal,” and sending or receiving an e-mail is not “removal.” Nor has there ever been any indication that any information was “delivered to anyone in violation of his trust.” I suppose I am not the first person to make a close analysis of the statute, and so I hope that you can shed light on the FBI’s decision by releasing any legal analysis that was done by the FBI or Department of Justice on this interpretation of the statutes in question. I would be very surprised if no one properly analyzed the statue, but if that is the case, then I hope that your report will include a discussion of this issue. The text messages between Peter Sztrok and Lisa Page are fascinating and provide a small window into the work done on the e-mail investigation. Although many right-wing critics have focused on various different aspects of their messages, I have not seen anyone really discuss the messages that pertain to the issues at stake in your investigation. As I have written previously, it is obvious to any objective observer that there was never probable cause to search the Weiner laptop for Clinton’s e-mails. Sztrok and Page both must have recognized this fact and I hope you have interviewed them on this crucial question. See for example Sztrok’s text on September 10, 2016 at 12:55:59 explaining why some laptops and media turned over were not reviewed during the Clinton e-mail investigation “They would not consent and we did not have probable cause to get on them.” See also Page’s text on October 27, 2016 (the day Director Comey decided to pursue the Weiner laptop review and write to Congress) “Please, let’s figure out what it is we HAVE first. What if we can’t make out PC? Then we have no further investigative step.” So, who decided after October 27 that there was probable cause to search the Weiner laptop? When and how was this decision made? Was it before or after Director Comey sent his letter to Congress on October 28? The search warrant application was filed on Sunday October 30. Who was involved in preparing the warrant application? Was everyone in agreement or was there dissent on this issue? Did the FBI handle it properly, or was politics or “optics” the main concern? I hope that these crucial decisions will be a focus of your report. What was Lisa Page referring to when she wrote on October 26, 2016 at 22:03:00 “Call you from the car to talk about Chaffetz and current issue”? Was Rep. Jason Chaffetz perhaps already aware that there were Clinton e-mails found on the Weiner laptop? Why was Lisa Page concerned about Rep. Chaffetz? When Director Comey testified on May 3, 2017 that there was a “junior lawyer” who asked whether he should consider the effects of his decision on the election, was that lawyer he referred to Lisa Page, or someone else? Why did Lisa Page write that she was “completely INFURIATED” with Jim Baker on October 27, 2016 at 14:26:02? What did Peter Sztrok mean when he wrote: “JB told me there was no requirement to recuse you, that is [sic] was optics, we went round and round playing that out”? What is Peter Sztrok referring to when he wrote on November 1, 2016 at 23:05:28 “Figured out why they legally can’t do what you just said. We are comparing against material (to determine what is new) that we obtained during the investigation”? I previously pointed out to you that it should have been quite simple to review the e-mails on the Weiner laptop to determine that there was nothing remotely new or incriminating. Was there some issue that slowed down the review? So far, the FBI has pretended that the review was time-consuming and Director Comey testified that the staff “moved heaven and earth” to get it done. I doubt that his characterization is correct and hope that your report will shed light on this aspect of the debacle. Please remember, they were searching for something that never existed, and that they had no indication existed. Thus, the question is how long it should have taken for the FBI to realize its mistake. What are Peter Sztrok and Lisa Page referring to when in the exchange beginning on November 2, 2016 at 00:45:44? Sztrok: “This response, from Jon:\n…and considering we haven’t shared any facts, those certainly aren’t factoring into decisionmaking. We should essentially have no reason for contact with NYO going forward in this.” Page: “I know. Which is what I tried to impose. God, this makes me very very angry. I honestly think I should bow out rather than find out things, be unable to tell Andy, and powerless to stop them.” Sztrok: “No. Need you on the inside now more than ever. Truly. And no bs, your country needs you now. \n\n We are going to have to be very wise about all of this. 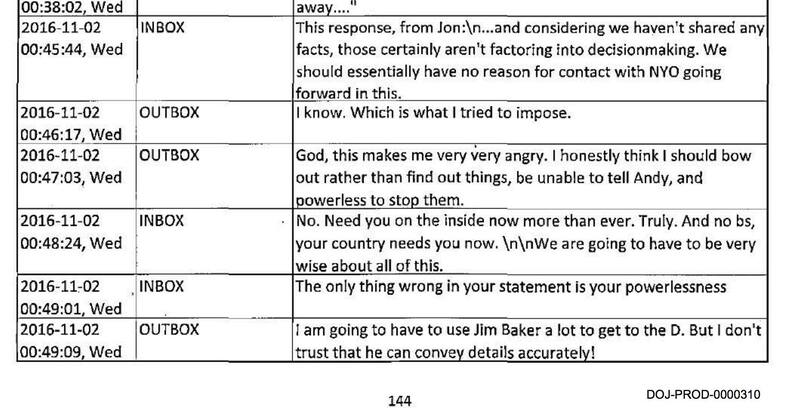 The only thing wrong in your statement is your powerlessness.” Page: “I am going to have to use Jim Baker a lot to get to the D. But I don’t trust that he can convey the details accurately.” This exchange raises a lot of concerns, the problem with the New York Office, finding things out (what things?) and not being able to do anything about them, not trusting Jim Baker to be able to convey details correctly to Director Comey. There seems to be something very wrong going on at this time. I continue to hope that your report will provide much-needed clarity and transparency concerning perhaps the most critical decisions ever made by the FBI. My personal view is that serious mistakes were made, and I am dismayed that Director Comey, who must be aware of them, has not conceded any of them. The country needs to know what really went on, what mistakes were made, and why, so that we can hope to prevent such mistakes from happening in the future. We cannot allow the FBI to interfere with our elections by pursuing unwarranted investigations of political candidates. Is FBI Attorney Lisa Page a Hero? This week, Senator Ron Johnson released an interim report on the FBI’s investigation of the Clinton Email Scandal. (See February 6, 2018 at https://www.hsgac.senate.gov/library.) The Report itself isn’t so interesting, mainly a list of facts and allegations that seem salacious to right-wingers, but don’t really amount to anything in particular. The accompanying documents are what interested me. But one thing that irks me about the memo is the careless misinterpretation of the law. The memo includes a whole section on “the law governing the protection of classified information,” which includes both a verbatim text of the law, as well as a misleading summary. For example, the committee says “Section 793(f) prohibits the mishandling of classified material through one’s gross negligence.” Well, no. The word “mishandling” appears nowhere in the law. “Mishandling” is much too vague a term to be used in a criminal statute. Instead, the law at issue (enacted 100 years ago during World War I) makes it illegal to permit the “removal” of documents, or to fail to report their removal. Here’s the big problem for all those trying to suggest that Hillary Clinton committed a violation of this statute. There is no “removal” of documents when you send an e-mail. I’ve explained this before in a previous blog but it deserves repeating. There is simply no law that could make simply sending and receiving e-mails from a private server to authorized recipients into a crime. I am certainly not the first lawyer to realize this. No doubt there were lawyers at the FBI and the DOJ who also understood that nothing that Hillary Clinton did with regard to her e-mails could ever result in a criminal conviction. Sadly, no one ever tried to explain this to the American public. Months before FBI Director James Comey’s public statements in July 2016, he and his staff began preparing for the day when they might have to explain that there was no case. They did this while they were still conducting interviews of witnesses, which Republicans believe is evidence that the investigation was not conducted properly. In fact, all it shows is that the FBI and DOJ were afraid to tell the Republicans that the entire investigation was not worth anyone’s time. For FBI lawyers like Lisa Page, the pointless, obviously political investigation of Hillary Clinton must have been frustrating. She was assigned tasks that she and her colleagues knew were never going to lead to the prosecution of any crimes. It was all politics — and not her politics. Unlike much of the FBI rank and file, Lisa wanted Hillary Clinton to win. And Peter Sztrok, an agent that Lisa worked closely with on counterintelligence cases, felt the same way. The two of them became close — too close. They started an affair, and began texting each other throughout the day. 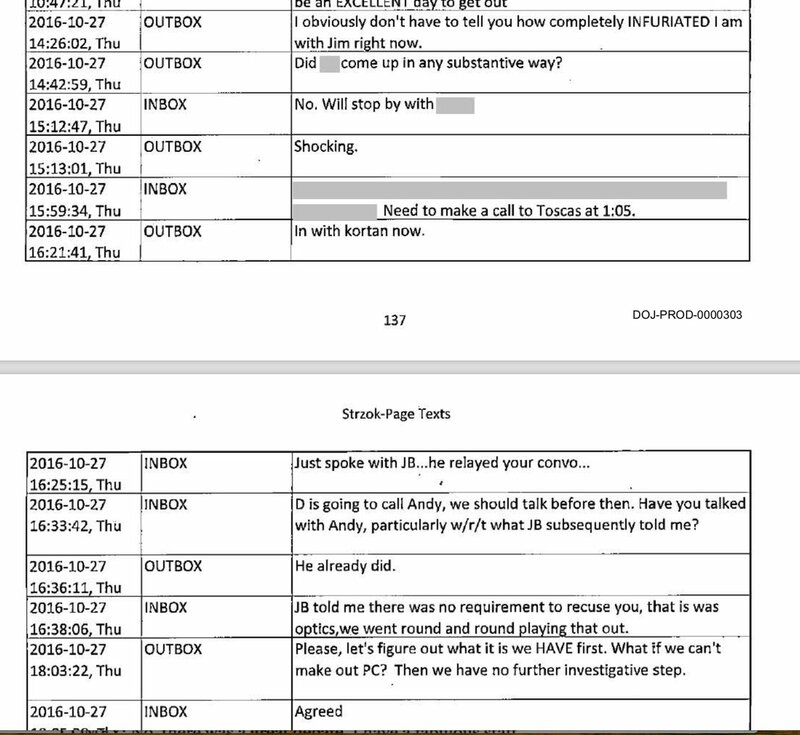 Those texts have now been released by Senator Johnson, giving us some insight into not only Page and Sztrok, but some of the senior management of the FBI. What was Lisa Page referring to when she texted to Peter Sztrok about Rep. Jason Chaffetz on the evening of October 26? Bill is Bill Priestap, head of counterintelligence and Peter Sztrok’s boss. On October 27, 2016, FBI Director James Comey held a meeting where he says that his team unanimously concluded that he had no choice but to reopen the email investigation and notify Congress. Last year, Comey testified that only one “junior lawyer” spoke up and suggested that maybe he was going to interfere in the election. We don’t know yet who that junior lawyer was. It could have been Lisa Page, but she’s not so junior, and now it looks like FBI general counsel James Baker excluded her from the big meeting because of “optics” (whatever that means). Read the exchanged from the afternoon of October 27 below. Outbox are from Lisa Page. Inbox are from Peter Sztrok. JB is FBI general counsel James Baker (Lisa’s boss). He was reassigned last month. Toscas is Deputy Attorney General George Toscas. Michael Kortan is the Assistant Director of the Office of Public Affairs. He manages the FBI’s public relations (and is probably the source of all authorized leaks). Andy is former FBI Deputy Director Andrew McCabe, who was pushed out of the loop on the e-mail case a week before these texts, after right-wing attacks based on democratic donor support for his wife’s failed Virginia state senate campaign in 2015. To me, the important part of these texts is at the end. “What if we can’t make out PC?” She’s talking about probable cause, the constitutional standard for obtaining a search warrant. As we know, the FBI obtained the warrant just four days later, on Sunday October 30. I and others who have reviewed the warrant application cannot find even the slightest probable cause to believe that the FBI would obtain evidence of a crime. Of course, none was ever found. The big question has always been who thought they would find evidence of a crime and why? It looks like Lisa Page tried to make the argument that there was no probable cause. Obviously, she was overruled by her boss Baker , as well as Comey, who was hell-bent on proving what an aw-shucks stand-up guy he was by reopening the investigation. A few days later, on November 2, we find this little nugget about the ongoing effort to review the emails on Wiener’s laptop. I’ve long wondered why it took a week for the FBI to determine that there was no new evidence on the laptop. After all, they had already reviewed all of the e-mails. How hard could it be to compare them? Well, apparently there was a problem, maybe due to security clearance issues, that prevented the FBI from comparing the e-mails. Lisa was trying to break the log-jam. It took a week before the FBI admitted that the laptop had nothing new. In that week, the election was lost for Clinton. I’m not sure what to make of this next exchange from November 2. It sounds a bit like Sztrok and Page were trying to wall off the New York office, which may have been the source of press leaks. Page is angry, and frustrated that she cannot get help from Andy McCabe, who has been recused from the whole case. Without McCabe’s help, Page felt powerless to stop the bad actors in the New York office. She didn’t have much faith in Jim Baker either. We’ve all been there. The boss is good at doing lunch but pretty worthless when it comes to understanding the details. We’re getting closer to understanding what exactly happened that led to the disaster of the Trump presidency. It was a comedy of errors (otherwise known as a tragedy). The people who understood and were capable of stopping the disaster were pushed out and excluded, because of “optics,” leaving only the bad actors and the head-in-the-clouds senior officials pretending to do the right thing, all the while doing exactly the opposite. Lisa Page is looking more and more like a would-be hero, someone who saw what was happening and tried to stop it.